Admittedly, I was skeptical about the new MacBook from the get-go. Despite my skepticism, I really do like to give everything a fair chance, so I tried to keep as open of a mind as possible. Rather than focusing on any specific feature of the MacBook and making an uninformed decision about whether or not I would like it, I instead simply pondered the question “who is this designed for?” Unfortunately, after spending some time with it in person, I’m no closer to answering that question. And that really is the big question - the only one that matters. If you don’t know or perhaps, in this case, you are confused about who your target audience is, then no matter what you build, it’s valueless. Don’t get me wrong, I’m all for innovation simply for the sake of innovation. But innovation for innovation’s sake is meant to be in the realm of research, not mass-production. I never got a clear sense of who the new MacBook was designed for or what particular gap it was supposed to fill. It’s too pricey for the casual Facebook peruser and too underpowered for the heavier user - your developers, your videographers, etc. For example, when the most recent Mac Pro was released, I immediately got a very clear sense of who the product was designed for. It was a beast of a machine, made for people who need serious power - such as photographers, video editors, animators, etc. Granted, it had a substantial price point to match it’s substantial build but at least it made sense. Even though it wasn’t a machine that would make sense for my budget or my needs, I appreciated it because it did fill somebody’s needs. They spent a lot of time in the Keynote talking about how innovative the new keyboard is. Perhaps the underlying technology truly is revolutionary but the typing experience is anything but. The keys are almost completely flush with the casing, meaning that there’s basically no key travel. To compensate for the lack of travel, they added a very slight click, similar to the click of pushing down the trackpad. However, it just makes the sound of the keyboard annoying while not increasing the tactile feedback, making for a sloppy and detached typing experience. Not to mention, there’s virtually no space between the keys. I believe their design intention was to provide a larger contact surface but what it actually does is make it easier to accidentally hit a wrong key. Remember how much everyone hated typing on the iPad’s virtual keyboard when it first came out? Yeah, it feels like a physical implementation of the iPad’s virtual keyboard. My initial assumption to the Force Touch trackpad, based on the above image, was that somehow it detected force intensity and performed different actions accordingly - some sort of pressure sensor. Introducing subjectivity into how a trackpad operates seemed like a terrible idea. The reality I discovered when actually using the Force Touch trackpad is, perhaps, even sillier. “Force Touch” simply means it has two clicks. Begin pushing down on the trackpad and you’ll feel the click you’re accustomed to. Keep pushing down a little more on the trackpad and you’ll feel another click. What the what?! To start with, I think the finish offerings (silver, gold, grey) are pointless, but I can understand how others might appreciate it. So I’ll leave that one alone. Let’s talk thickness. 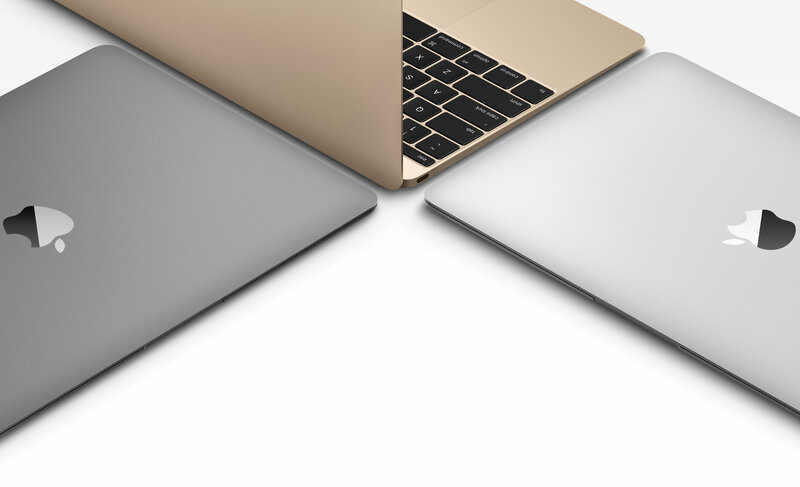 Does it really matter that the MacBook is about a tenth of an inch thinner than the MacBook Air? I would argue that it does not and that we need to stop playing the “thickness game” altogether. There becomes a point (and I believe we’ve already reached it) when computers are as thin as they ever should be, even if it was possible to make them thinner. Eventually, we may have the technology for a computer to be as thin as a piece of paper but would that actually make any sense for conventional use? When I first picked up the MacBook, it wasn’t obvious that it was thinner than the MacBook Air. They’re both incredibly thin. If I had set a MacBook Air right next to the MacBook, I may have been able to see the difference but, again, so what? And I know this is extremely nit-picky but I really miss the comforting glow of the apple on the back of the screen. It’s a tiny detail and one that most people would, likely, consider insignificant. But to me it’s one of those things that sets Apple apart from the rest of the notebook white noise. It looks classy yet welcoming. An indicator of the premium product that it is. As confusing as everything else is with this machine is the naming decision. Traditionally, the MacBook is supposed to be the entry-level Apple notebook. It’ll get you into the Apple family without breaking the bank but also without giving you the most power that Apple can provide you. If you needed more power, you could step up to the MacBook Pro - “Pro” indicating that it’s a machine capable of providing professional levels of functionality. Then the MacBook Air was released. It was thinner and lighter than the standard MacBook, hence the name “Air”. It all makes sense. But now, even though the MacBook Air is still a product line, there’s a thinner and lighter machine than the Air. Is it called the MacBook Air 2 or perhaps the MacBook Airier? Nope, it’s just called the “MacBook”. Again, what the what?! Clearly, this is not a machine for me but I’d love to hear some other opinions about it in the comments. Your topic is very interesting and informative for readers. You have shared very important technical features about New Macbook. Buy Apple MacBook laptop Chargers Adapters online at the affordable price. Starting in August of 2015, I began building a company called MailSnail with my friend and co-founder, Matt Bertino. To follow along with my personal thoughts on the ins and outs of the company, experiences, lessons learned, technical details, etc., please check out the posts below. I’ll continue to add new posts here as I publish them. This is the second post in a series I’m writing about a company I’m starting up (or have started, depending on when you’re reading this). You can read other posts in the series here. As I’ve talked about here, I’m starting a company called MailSnail. In this post, I want to share the ins and outs of how we’ve built the product (i.e. the actual web application). The Buzzwords I’ve tried my hardest to make this post as approachable as I possibly can for anybody and everybody. I don’t want this to be something that is only interesting to folks who know what HTTP stands for or can rattle off it’s associated status codes. So for my non-tech readers, please bare with me for this one section and keep on reading.